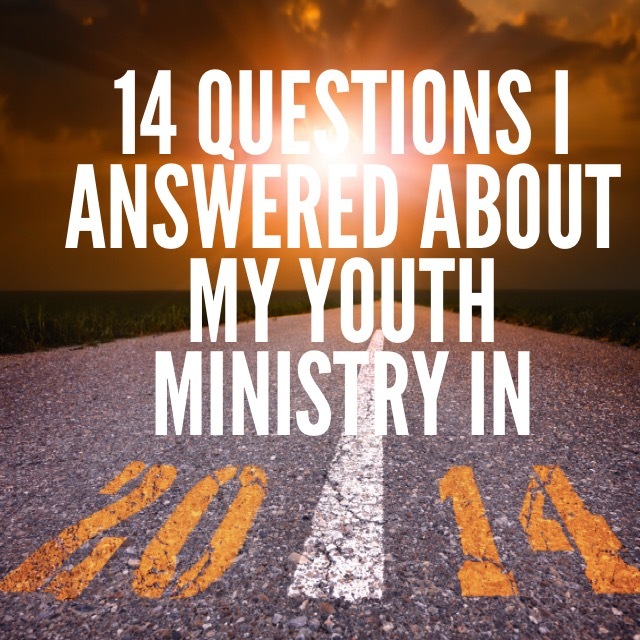 At the first of the year I posted 14 questions that were on my “to do” list as far as digging deeper into why we do what we do and how can we get better as a youth ministry. Well, it’s the end of the year and it’s time to see how well I did with this years questions. 1. What will define success this year? I think, for us, it was about getting a semblance of continuity. Our band was up and down, our volunteers were up and down, and I just wanted to stop the motion sickness of our ministry. Right before summer we had some good changes in our band and staff and we were able to set a course for the future. We didn’t nail this one but I think we were successful in navigating the changes. Youth Convention.The time was not right and we did not have the momentum. Christmas prayer stations. No one missed them and no one asked for them. We used to have a resource table in the room but I did not put the time in it deserved. The Sunday Night SOAK was a Sunday night prayer and worship service that worked for a couple months but than faded. 5th Quarter – We did not repeat this because we just did not have the budget or the passion behind it like we did the year before. I think we plodded along but saw glimpses of kids “getting it” and that was good enough for me. 4. What changes should I make in my youth room that will help kids connect with God and each other? I was not able to answer this one. It’s back on my list for 2015 though. 5. How will I intentionally grow in my relationship with God this year? Although I prayed and read scripture I did not get a breakthrough until I went and served at the NYWC this year. While I was there I met with a spiritual adviser and served other youth workers. It was like my own personal mission trip. 6. How will we reach out more effectively? This was a great year for outreach,. Our summer Blitz program grew and we saw a lot of kids come through our doors. By the end of the year we saw several young men and women commit and re-commit their lives to Christ. 7. How will I grow my volunteers numerically and spiritually? We added four new volunteers this year with the potential for one more. Two of the new volunteers will be launching our middle school ministry. This coming yearm 2015, is the year of skill building and helping our volunteers really take another step on learning how to minister to kids. I’ll be using some of the sessions from the NYWC as part of our monthly meetings. I think I’ll give myself a C in this area. Of all the areas I think I did a good job of building relationships with out young adults through various ministry opportunities. 9. How will I balance my family/ministry time better this year? I had some great family moments this year by just committing to being at home more. Instead of making that one stop before I went home, I just went home. 10. What risks will I take this year to make an impact for Christ? This is a tough one to gauge because sometimes everything feels like a risk and some things don’t feel risky enough. In 2015 though we put our stake in the ground on student leadership. 11. How will I use social media better this year to connect with students and build our program? I also did a few online service videos for the holidays where we did not meet. I teach about how to create your own HERE and the tow I created this year are HERE and HERE. 12.. How can I do better job of helping parents disciple their kids? I sent out my weekly newsletter filled with links to articles and paid more attention to our Parent Facebook Group. 13. How can I do a better job of connecting our adults and students? This past year we did a few church wide events such as Harvest Festival and we painted a local school. In addition we had a mens weekend where the younger and older men worked around the church and had service together. 14. Will we look/act more like Jesus this year than last? I would say yes to this. I think the kids as well as our adult staff matured in Christ this year. Did you use these 14 questions last year? How did you do? What questions are you asking in 2015?